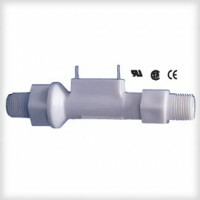 This slim, inline flow switch reduces pressure drop to a minimum. They incorporate a unique, dual-diameter, internal bore and piston configuration to minimize flow constriction. Liquids are able to smoothly pass around the piston and flow through the switch with little pressure loss to the down stream line. Processing & Dispensing Equipment: Water Purifications and Filtering, X-Ray Film Processing, Beverage Dispensing, Chemical Additives, Gas Sampling, Distilling. When the magnetic field of permanent magnet inside the shuttle or piston is moved into the proximity of the reed switch inside the stationary stem, the reed switch contacts “snap” together and closes the electrical circuit. When the magnetic field is moved away from the reed switch, the reed switch contacts move apart and the circuit is opened. Why not give our friendly team of experts a call now?